I have been doing a work in many of you that has been uncomfortable and unfamiliar. Though this short season of transition is challenging, it is positioning you for a new assignment, a new identity, and a new level of authority in the kingdom. Do not be discouraged or disheartened. I am the Lord of this transition and I have good things stored up for you who walk in the fear of the Lord (Psalm 31:19-20). My goodness is being stored up, and it’s about to be poured out! I am dismantling strongholds and mindsets that have kept my sons and daughters limited in their capacity and authority to defeat the works of darkness. I am reassigning many from the defensive posture in prayer to the offensive position in victory. This is no longer a time to speculate on the enemy’s plans and purposes, but to look and listen to me for My plans and purposes. There is a subtle lie the enemy has planted that to know the enemy’s schemes is to be powerful and even prophetic. But I tell you that you are called to know My business, first. It is he who sees and hears what I am doing that is the most powerful (John 15:15). All of hell must bow to My agenda and every scheme and plot must submit to heaven. You are the most powerful when you recognize what heaven is doing and follow with your words and actions (John 8:28). I am looking for those who listen and SPEAK WHAT THEY HEAR Me saying. It is through the Word of Faith that signs and wonders follow (John 4:50). This is why the enemy tries so hard to silence believers. Your voice has power in the spirit! As you speak, mountains of doubt and fear will move and My truth will shatter lies and deception. USE IT! I will strengthen your right arm which is the arm of authority. Many of you have held the shield of faith as a defensive weapon in your left arm. Your faith will no longer be a defensive weapon, but an offensive one. For some, I am even stripping your defenses and the past ways you have functioned in order to handicap you towards your right arm which carries weight in the spirit. You must learn to think as a victor and not one being attacked. Move forward with confidence and wield the sword of my Spirit which carries Life and Power. As you go about My Father’s business, the enemy WILL get in the way. However, do not be distracted or disoriented. As you stand firm and speak My Word, demons must bow and you will win the victory. Your battles are not to be fought on the battlefield, but in the courtrooms of heaven. This is where your greatest authority is and where My purposes are settled. The Accuser of the Brethren may bring charges, but I have already purchased the legal right to overthrow him in every case. My blood has already won EVERY victory. I have given you that same right and authority to bring before My throne. USE IT! Make sure he has no legal loop hole against you and you can be assured of victory. The Spirit of Unbelief is on the increase and many are being offended by the way I am moving. 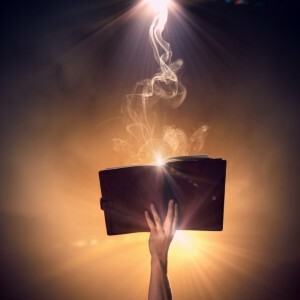 Just as Jesus could “…do no mighty work…because of unbelief” (Mark 6:2-6) so many in the body of Christ are letting offenses strip them of supernatural faith. I am doing a new thing and the familiar ways of the past must be examined so as to not limit your perception of the future. Allow yourself to dream and imagine the seeming impossibilities. Do not be surprised at the people I choose and use. They may live next door to you; they may be in your own family, they may even be heathens. I am purposely shifting cultural and generational mindsets which have stood in the way of kingdom realities. I am taking you to a new plane of existence where the impossible becomes possible, where the foolish confound the wise, and where the least of things become the greatest. I am purposely shaking things up to get your attention and empower you for what’s ahead. Strengthen yourselves and speak up. You are not on the defense any longer. I call my Bride to courage and boldness to know Me and to speak of My great love to those who have never heard. Know that your joy will be full as you walk in this reality, for you WILL see My goodness as never before. Wonderful prophetic message of the coming change! Embrace it everything is NEW! ….. Praise Jesus! Thank you. Good post. You might like the following. Be blessed. The Lord Jesus has called His people to the Spirit-filled Life and Holy Spirit led assemblies from the very beginning. That hasn’t changed. Yes yes yes! This truth bears such witness with my spirit and is so encouraging. Thank you for this timely word, Wanda! Reblogged this on Wisdom Builds The House. Could not have said this better as far as what Yahweh has been impressing upon my mind. We are facing the release. There was a time to remain silent and weather the winds as they stove upon our face, but that period is ending. Gather that which you’ve learned in the wilderness, and bring it into the camp of those that look upon His face continually. It is time to shine forth. The period of captivity is now turning.